There seems to have been a bit of a revival of the music of violinist Antonio Bertali (1605–1669), who spent the last 20 years of his life as Imperial court Kapellmeister in Vienna. Trained in Verona, one of the main centers for early violin performance, he seems to have gone directly into Imperial Service at the age of 17, and over the course of his career became quite well known for his vocal and instrumental works. This disc of eight sonatas follows a series of recordings beginning with CPO back in 1998 (reviewed in Fanfare 22:3). It comes almost on the heels of a recent disc of sonatas performed by Acronym on Olde Focus, reviewed favorably my colleague Barry Brenesal in the last issue. There is also a nice Ricercar disc from 2010, though I confess not to have been able to listen to it. The sonatas themselves, originally for strings but performed here with a combination of cornett, trombone, and dulcian, all owe much to the instrumental works of Giovanni Gabrieli, but with the more dance-like qualities to some of the movements, one might bring in composers such as Biagio Marini and Claudio Merulo, and even his younger contemporary Heinrich Schmelzer. There is certainly something Venetian about the opening portion of the Sonata XII, with echoing effects in the trombone and cornett; and though the dulcian has some interesting running lines connecting the sections, it is the parallelisms in the two brass instruments that evoke the grandeur of St. Mark’s under Gabrieli. Bertali’s themes do tend to have a fair amount of chromaticism within, but in shorter works such as the sonata for two violins (here performed as cornett and violin) and continuo, one finds that the melodic and rhythmic motion are pure dance. Bertali knows when to resort to more sepulchral tones and when to let his instruments wander, weaving in and out of each other. His use of ostinato basses also helps give this a variation structure wherein the mood is easier to alter on a whim. The notes go to some lengths to discuss the state of the sources (interesting to musicologists but not really titillating to the average listener) and the reasons for replacing the strings with winds. 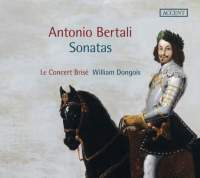 Basically, it boils down to the fact that some of the sonatas have a more limited range and virtuoso content that “fit well” with the instruments that cornettist William Dongois chooses. Missing is the main issue of music of this period, for which such justifications are largely moot, since it was meant to be performed by whatever instruments one had available at the time. Thus, although violins and gambas are occasionally mentioned, no one would have objected to any other combination that could play the notes. That being said, the use of the cornett and dulcian, the former performed by Dongois with clarity and accuracy, brings out considerable character in the sonatas. The violin of Anne Schumann is also noteworthy, using just a touch of vibrato here and there, especially in the sonatas. Her moment to shine is in the rather fiendish Ciaconna for violin and continuo that has seen a number of iterations in the performance world in discs of the violin music of this period. It begins sedately enough, but soon expands technically to require a sort of virtuosity that one might associate with Vivaldi (though without his distinctive character). Bertali also requires a rather more complex continuo in this piece, which is ably performed by Hadrien Jourdan. The sound is generally quite rich. My only concern is the violin in the Ciaconna, which seems at times to be teetering on edge, making paradoxically Schumann’s normally full sound thin out in some of the virtuoso passages. Still, all things considered, this is a disc with music well worth exploring. It is interesting, shows a sense of history, and is graced by fine performances.